A good 20 years ago when I penned stories for the now-defunct custom harley magazine IronWorks, the late editor Dennis Stemp amassed an impressive collection of motorbikes. Mostly British classics, American V-twins and the like, he also had a taste for custom cafe racers. 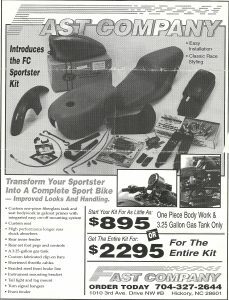 I recovered this advertisement for a long-gone North Carolina aftermarket firm who was then manufacturing these amazing bolt-on cafe racer conversion kits for Harley Sportsters and wondered why neither Dennis nor I ever bought one. The kits were fairly comprehensive in their design offering a few genuine performance upgrades- shocks, rearsets and braided brake lines- with a svelte, fiberglass bodywork set that really brought out the sport in Sportsters. Too bad the company folded before this cafe-in-a-box caught on with the general riding public which, today, would be gobbling these goodies up like there’s no tomorrow.